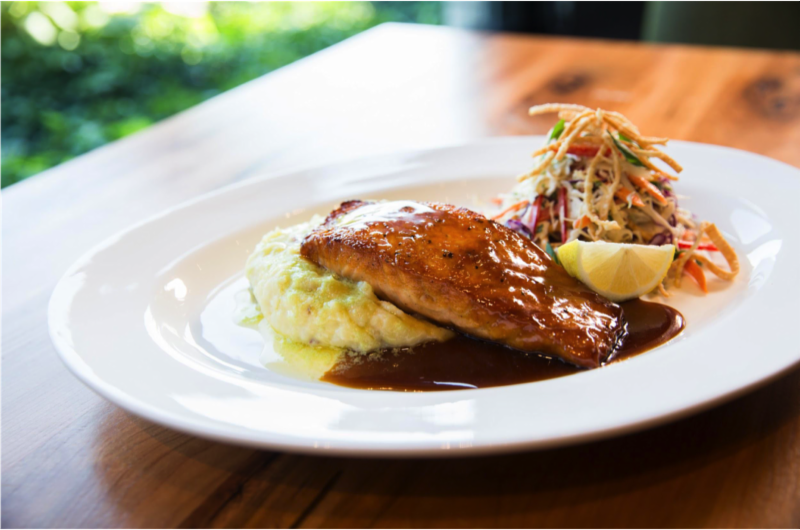 Celebrate Veterans Day at Cooper's Hawk Winery and receive a complimentary glass of wine with any entrée purchase. From the masters of the Renaissance to the Romantic painters of the 19th century, the art of ancient Greece and Rome has inspired artists for over 2,500 years. As Picasso painted the Minotaur repeatedly and modern artist Cy Twombly inserted ancient Greek words into his paintings, antiquity continues to act as a key impetus for contemporary artists. "Inspired by Antiquity" will parallel the Field Museum's groundbreaking exhibition "The Greeks: From Agamemnon to Alexander the Great", on display from November 2015 through April 2016. 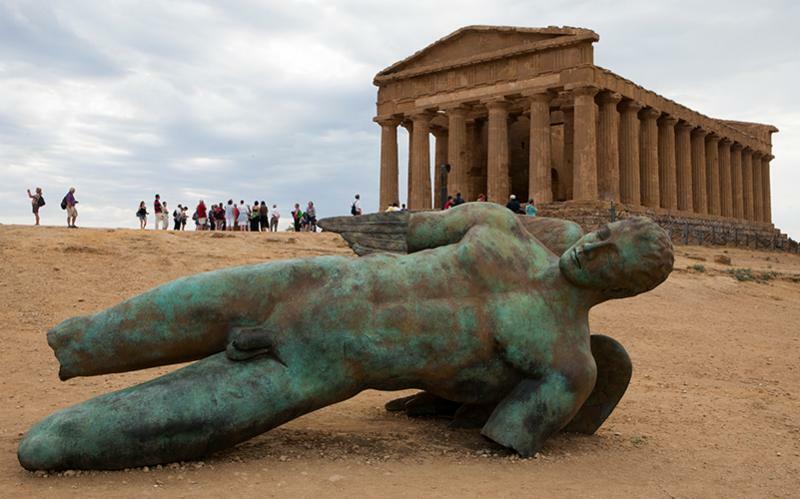 While "The Greeks" sheds light on the fascinating history of ancient Greece and Rome, "Inspired by Antiquity" will illustrate the unbroken line of inspiration in art from ancient times to the present. "AN EVENING WITH THE ARTIST"
In the meantime, please join us as we celebrate SOFA 2015 on November 6. From the perfectly defined torsos of gods and goddesses to stylized busts of emperors and generals, sculpture was one of the most widely practiced art forms in ancient Greece and Rome. 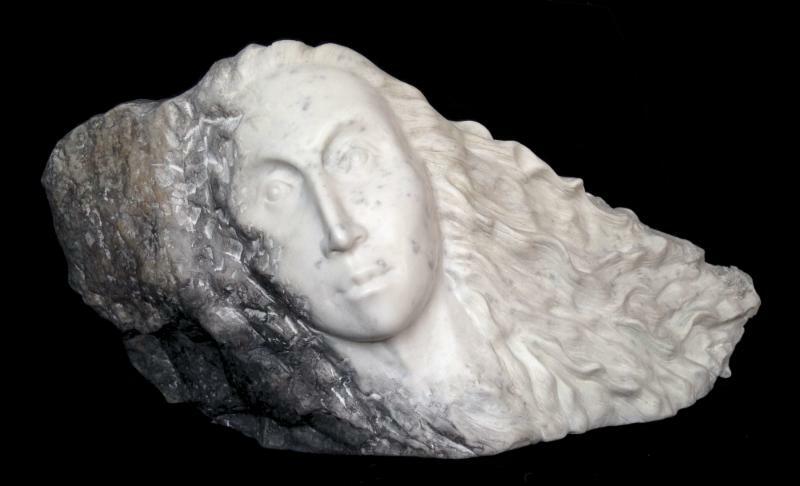 Artist and playwright, Jyl Bonaguro carries on the tradition with her marble and alabaster sculptures. Using the same tools used by ancient Greek and Romans, a hammer and chisel, she carves images that resemble broken pieces of ancient statues. These beautiful figures are purposefully fragmented with parts left unfinished in order to expose the fallacy of immortality. Chicago resident Peter Sorel, of "Hollywood to Chicago" fame, has been an avid photographer since the age of thirteen. Immigrating to the United States in 1959 from his native Hungary, he became one of Hollywood's most sought after photographers, documenting movie sets and creating stunning poster images for more than 120 films including Easy Rider, One Flew Over the Cuckoo's Nest, Frida and Life of Pi. In February 2014, Hilton | Asmus Contemporary showcased his celebrity photographs alongside Mark Rothko inspired images shot along Lake Michigan in his Homage to Rothko: Lake/Sky series. Sorel departs from the glitz and glamour of Hollywood to a time that inspired the stories behind the big screen. where an installation of monumental sculptures by Polish sculptor, Igor Mitoraj were on exhibition. Sorel's photographs capture an image of fallen and broken gods and goddesses surrounding the temples where they were once worshipped. EVE OZER "THE POWER OF MYTH"
Featuring Chicago based artists, as well as internationally known artists from Europe, and in particular, the Mediterranean, the gallery is located in the River North Art District at the corner of Wells and Superior. Poulos captures a lost piece of Greek history that rested on the bottom of the sea for 2,000 years. 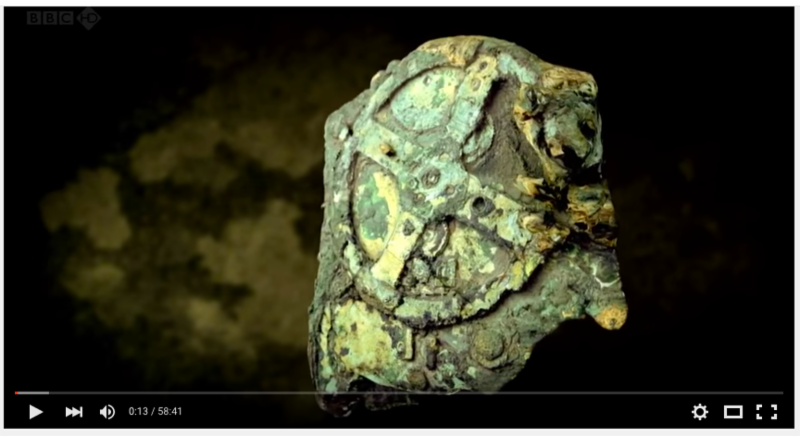 The Antikythera mechanism is hailed as the world's first computer. The astrolabe was used as an astronomical calculator/planetarium functioned to predict lunar and solar eclipses, the alignment of celestial objects, procession of the equinoxes, movement of the five known planets at the time, and optimal times and regions to host the ancient Olympic Games. 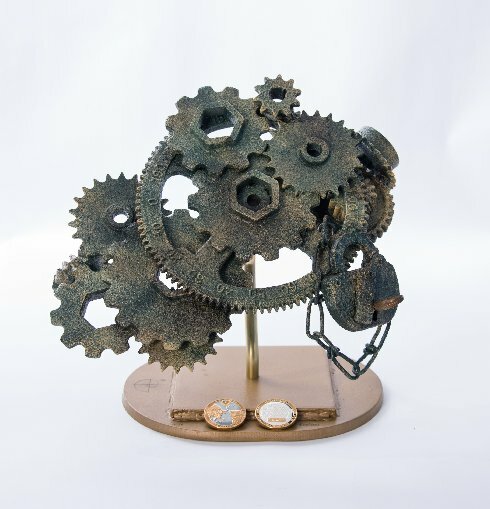 Composed of bits of gears, tools and metal objects with a verdigris patina, Poulos recreates this enigmatic machine. 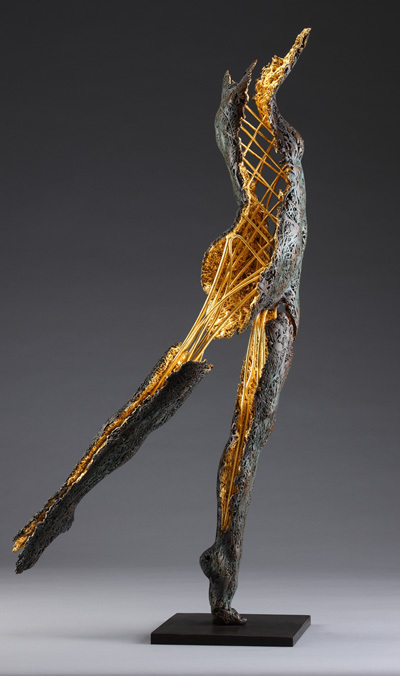 A longtime resident of Monte Carlo, Canadian sculptor Blake Ward's new works from his Spirits Collection provoke introspection, illustrating his contemporary approach to classical figurative sculpture and his development from firm academicism to a new liberating metallic expressionism. Building on the techniques of figurative sculpture developed in antiquity, his newest pieces challenge the classical figure by opening up the interior space of the human form as a way to search our inner selves. While Ward remains true to the representational quality and the realistic proportions of traditional sculpture, Spirits crosses over into abstract and ethereal realms where he aims for provocative figures that expand the consciousness of our inner realities. Ward's 1/4 scale, partial figures break away from all the fundamental rules of bronze sculpture. A native of Greece, emerging artist Manolis Tzortzakakis' abstract paintings are infused with the myths of ancient Greece. 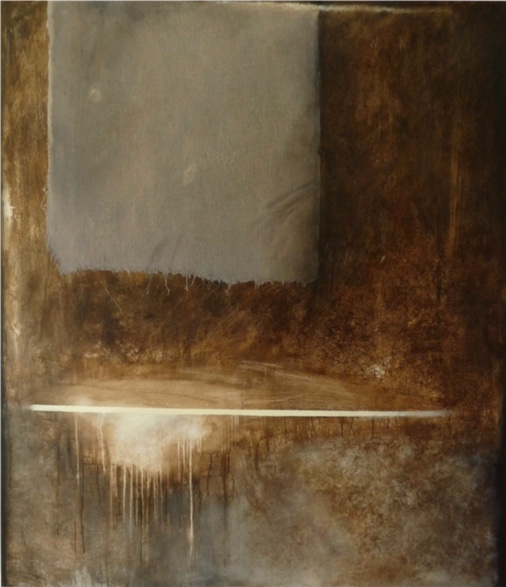 Moving to Chicago in 2014, he incorporates the light and atmosphere of his new home into his work. Manolis' interest is not in depicting an accurate image of a natural pattern or an artificial reproduction, but he attempts, by removing individual and temporal features to convey a direct "view" of the sense or essence of the world. The 51st Chicago International Film Festival celebrated cinema and Chicago's Impact on Industry. (CHICAGO, Nov 5, 2015) - Cinema/Chicago's Chicago International Film Festival wrapped up its 51st edition on Thurs, Oct 29 with its Closing Night presentation of the Festival's Audience Choice Award winner Spotlight (USA), starring Michael Keaton, Mark Ruffalo, Rachel McAdams, Liev Schreiber, Brian d'Arcy James and Stanley Tucci, plus popular encore presentations of the Festival's International Feature Competition winner, A Childhood (France), and New Directors Competition winner, Underground Fragrance (China). Over the course of the two-week event, the Chicago International Film Festival saw an increase in audience attendance as compared to 2014. This year, Festival audience members were delighted by new programming highlights such as Industry Days, a new culinary cinema program that offered one-of-a-kind experiences with food and film, and Spotlight: Architecture+Space+Design. Official selections at this year's Festival featured over 140 feature-length narrative & documentary films and 54 short films from 50 countries, celebrating diverse cultures. Directors from around the world attended the Festival to introduce their films and hold post-screening Q&As. This year's Festival also welcomed back works by such acclaimed directors as Charlie Kaufman, Apichatpong Weerasethakul, Hou Hsiao-Hsien, Frederick Wiseman, Chicago's own Stephen Cone, and Michael Moore, whose film Where To Invade Next won this year's Founders Award, which is given to one film across all categories that captures the spirit of the Chicago International Film Festival for its unique and innovative approach to the art of the moving image. "Michael Moore is quite a character and his films are important. He's changed the way we look at the documentary in so many ways. You either love him or you hate him, but he's always been a director to watch," said Founder & Artistic Director Michael Kutza. "'Where To Invade Next' doesn't disappoint." Where to Invade Next (USA) was also the winner of the Festival's Audience Choice Award for Best Documentary. Other Audience Choice Award winners included Spotlight (USA) and Mustang (France, Turkey). Festival audience members received a ballot at each public Festival screening. Overall, audience members gave this year's Festival films an average rating of 4.2 out of a 5-point scale. The 51st Festival also paid tribute to the achievements of producer Gigi Pritzker, director Charles Burnett, composer Howard Shore, actors Sarah Silverman (I Smile Back) and Christopher Abbot (James White), and director Josh Mond (James White). The Festival's programming featured Special Presentations of U.S. Indies and Oscar hopefuls such as The 33, Carol (winner of this year's Gold Q Hugo), I Smile Back, Spotlight and this year's Surprise Film, Lenny Abrahamson's Room-one of the best-reviewed films of the year. Films from Austria, Argentina, Brazil, Chile, China, Columbia, Croatia, Denmark, France, Iceland, Iran, Netherlands Portugal, Switzerland, United Kingdom, and the United States won the Gold and Silver Hugos in the Festival's competitions: International Feature, New Directors, International Documentary, OUT-Look/Q Hugo Competition, Short Film, and Chicago Award. The second annual Roger Ebert Award, which is presented to an emerging filmmaker whose film presents a fresh and uncompromising vision, was awarded to Ida Panahandeh's Nahid (Iran). "The Festival took audiences on a journey through cinema," said Founder & Artistic Director Michael Kutza. "We are so pleased to introduce Chicago audiences to new films and filmmakers while paying tribute to industry trailblazers." "We were thrilled to welcome so many new and returning guests to the Festival this year to participate in screenings, Industry Days, and events," added Programming Director Mimi Plauché. "Our audience members embraced the films we presented and engaged the filmmakers in spirited conversations about the films, their process, and the cultural context of their work." Industry Days successfully connected local and visiting filmmakers with their peers and industry executives. The inaugural conference was presented by Lead Partner TIAA-CREF with additional support from Tribune Media Company, Columbia College Chicago, and OtterBox. The four-day event launched with an Industry Tribute to producer Gigi Pritzker, moderated by Andrea Wishom, Chief Operating Officer for Skywalker Properties Ltd. and former Executive Vice President of Harpo Studios. "Our Industry Days venues, the Tribune Tower and the AMC, were buzzing with invigorated attendees, discussing and debating what it takes to produce and release successful movies both in Chicago and the marketplace, at large," said Anthony Kaufman, programmer of Industry Days. "It was great to see such a cross-section of filmmakers, film students, and film and media talents, listening to and interacting with veteran industry professionals, and looking for ways to push their projects forward." Featured panelists included writer-director Steve Pink (Gross Pointe Blank, Hot Tub Time Machine, New Girl); actor-producer-director Jeff Garlin (Curb Your Enthusiasm, I Want Someone to Eat Cheese With); Kickstarter co-founder Charles Adler; Chicago directors Stephen Cone and Kris Swanberg; Richard Lorber, distributor of films by such acclaimed directors as Steven Soderbergh, Jean-Luc Godard, François Truffaut, and John Woo; Tom Quinn, distributor of films such as Where to Invade Next and the Oscar-winning Citizenfour; and Amy Hobby, producer of such films as Secretary, What Happened, Miss Simone? and co-founder of female-driven production company Tangerine Entertainment. Speakers from the following companies also participated: IFC Films, Magnolia Pictures, The Orchard, Sundance Institute, MPI Media Group, Music Box Films, Kino/Lorber, The Film Collaborative, Film Buff, The Film Sales Company, Preferred Content, ITVS, Kartemquin Films, and the Chicago Media Project. Industry Days ended with a competitive Pitch Session ("The Pitch") co-produced by IFP Chicago that made audiences and industry leaders aware of remarkable works in progress. "The Pitch" was judged by a panel including Amy Hobby (producer), Aijah Keith (IFC Films), Steve Pink (producer), and Brett Hudson (producer). Judges offered constructive feedback with humor and grace. A curated selection of six filmmaking teams with new narrative projects participated. An Honorable Mention was given to Fawzia Mirza, Brian Hieggelke, and Eugene Park for their film Signature Move (about a 30-something lesbian who flounders in life, love and wrestling, trying to reconcile who she is with the values of her religious, TV-obsessed mother). Signature Move will receive support from IFP Chicago. The winning pitch went to Amelia Dellos and Eric Anderson for their film Oriole Park (about a serial killer who looms over the tightly knit community of Oriole Park as a string of disappearances lead neighbors to suspect one of their own). Dellos and Anderson received an award of in-kind services worth over $20,000 from such companies as Magnanimous Media, AVID, Hewlett-Packard and Stage 18, as well as support from IFP Chicago. The Festival's new culinary cinema program successfully paired food and film. "When we found three terrific films with gastronomic themes, and all with Chicago ties (Birth of Sake, Open Tables, and Breakfast At Ina's), it seemed like a natural decision to 'event-ize' the screenings with local restaurant tie-ins. We couldn't be happier with the way these events have come together with great movies and great food and drink partners," said the Festival's Programming Team. Breakfast at Ina's became one of the most popular films at the Festival. The film's World Premiere and Local Root event was the fastest program to sell out of any other film/event at this year's Festival. In conjunction with the Chicago Architecture Biennial, the Festival programmed a special series called Spotlight: Architecture+Space+Design, featuring a World Premiere, two North American Premieres, and four USA Premieres. From Tokyo to Milan to Sao Paolo, the international selection showcased 11 new feature films, including notable portraits of architects, designers and buildings (Concrete Love - The Bohm Family, Why A Film About Michele De Lucchi?, The Infinite Happiness) and beautifully photographed depictions of contemporary and futuristic cities (Obra, Invention, Under Electric Clouds). From subways to skyscrapers, from down-and-out squatters to glass-house-dwellers, these films portray a range of people and characters interacting with extraordinary places and spaces. In addition to a program of shorts, a Chicago Film Archives Program ("Modern Metropolis"), and the feature-length films, the Spotlight featured a discussion with world-renowned architect Helmut Jahn. The Festival's Spotlight: Architecture+Space+Design program is supported by its Program Partners: Chicago Architecture Biennial, The Richard H. Driehaus Foundation, Tribune Media, Italian Film Commission, and Italian Trade Agency. Cinema/Chicago's Education Program held eight FREE film screenings at the 51st Chicago International Film Festival, a highlight of the year-round program's mission of connecting students, teachers and young filmmakers with unique and engaging media literacy opportunities. The Education Program's Education Screenings were held each weekday morning during the Festival at the AMC River East 21, 322 E. Illinois St, Chicago. "The films we present to students during the Festival are a vital piece of the full Education Program puzzle," says Rebecca Fons, Education Director at Cinema/Chicago. "With the Education Screenings, we give students from across the city the opportunity to see films they would not otherwise experience. With our post-screening discussions, we further engage the students by hearing their opinions, answering their questions, and speaking as a group about film. In the twenty years since the Education Program's inception, we've welcomed well over 100,000 students to the Program, and we've done it all at no cost to schools, teachers, or students." Cinema/Chicago's 52nd Chicago International Film Festival will be held October 13-27, 2016. Cinema/Chicago is a not-for-profit arts and education organization dedicated to encouraging better understanding between cultures and to making a positive contribution to the art form of the moving image. The Chicago International Film Festival is one of the year-round programs presented by Cinema/Chicago, which also include itsTelevision Awards, CineYouth Festival, INTERCOM Competition, International Screenings Program, and Education Program. More information at ChicagoFilmFestival.com. Mayor Rahm Emanuel and the Department of Cultural Affairs and Special Events have announced plans for this year’s Veterans Day Ceremony, which will be held at Soldier Field, Gate 0 on November 11 at 11 a.m. The ceremony will include a speaking program with participants representing each branch of the United States military. The ceremony will once again take place in front of the Doughboy statue. Along the wall are benches to provide seating and moments of reflection. The benches contain notable quotations regarding the efforts of those who serve our country. Actual Military Medals of Honor representing the various branches of the Armed Forces are cast into the backrests. The program will culminate with a wreath laying ceremony at the Doughboy, a 21-gun salute, “Taps” and the “Armed Forces Medley”. Soldier Field was named as such at the request of the Gold Star Mothers to honor the men lost in World War I. The Doughboy statue, originally placed in Garfield Park, was restored and installed in Soldier Field as part of the stadium renovation. Doughboy is an informal term for a member of the United States Army of Marine Corps, especially members of the American Expeditionary Forces in World War I. 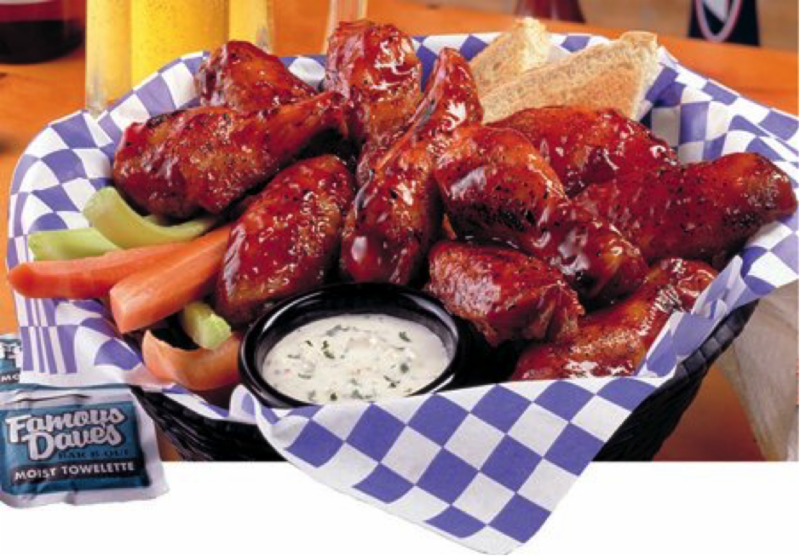 FREE parking is available at the Waldron Parking Deck; exit at 18th Street from Lake Shore Drive. For information on all programs presented by the Department of Cultural Affairs and Special Events, visit our website at cityofchicago.org/dcase and join us on Facebook and Twitter @ChicagoDCASE. Macy’s on State Street welcomes London-based “Art You Grew Up With” to the United States. The installation, launching exclusively in Macy’s on State Street, offers shoppers unique and customized merchandise from the iconic and beloved characters of PEANUTS®. Offering framed and unframed art prints, mugs, cell phone cases, iPad cases and t-shirts, beginning at $20, customers can pick the colors, characters and messages of their choice, for the perfect customizable gift. Choosing Macy’s on State Street as its exclusive launch in the United States, “Art You Grew Up With” also offers special Chicago-themed merchandise, from Chicagoans’ love for sports to the City’s iconic flag and architecture. All customization is done in store, and is ready to take home within 30 minutes. Macy’s and “Art You Grew Up With” have also hired local art students from neighboring schools, including Columbia College, to create the one-of-a-kind works of art. Macy’s is nuts for PEANUTS! Additionally, Macy’s on State Street’s holiday window displays will incorporate a PEANUTS themed window. Macy’s also just announced its collaboration with PEANUTS in celebration of the PEANUTS 65th Anniversary and the golden anniversary of the classic holiday animated special “A Charlie Brown Christmas,” along with a new Snoopy’s Doghouse float debuting this year in the 89th Annual Macy’s Thanksgiving Day Parade. In celebration of the Macy’s on State Street Great Tree Lighting on Saturday, November 7, “Art You Grew Up With” will offer a commemorative PEANUTS themed Great Tree Lighting mug, available for a limited time. “Art You Grew Up With” (artyougrewupwithintl.com) is owned by Russell Singler, now celebrating his 20th year of connecting fans with the art and gifts they love. Working with the UK’s most prestigious retailers such as Harrods and John Lewis, and three other stores in Selfridges London, Manchester and Birmingham the company is committed to providing a unique and irresistible shopping experience. The company has become the official ‘go to’ partner for instore personalization, representing some of the world’s most loved and cherished brands including Beatrix Potter, Peppa Pig, Mr Men, Paddington Bear, and for the 2015 Holidays in the UK; Star Wars. “Art You Grew Up With Personalization, LLC” was established to bring this exciting in-store concept into the US market, collaborating with Peanuts Worldwide LLC and Macy’s to celebrate PEANUTS® 65 year heritage. FREE Screenings At The Chicago Cultural Center! Holiday Gift Guide: Accessible Luxury Handbags!